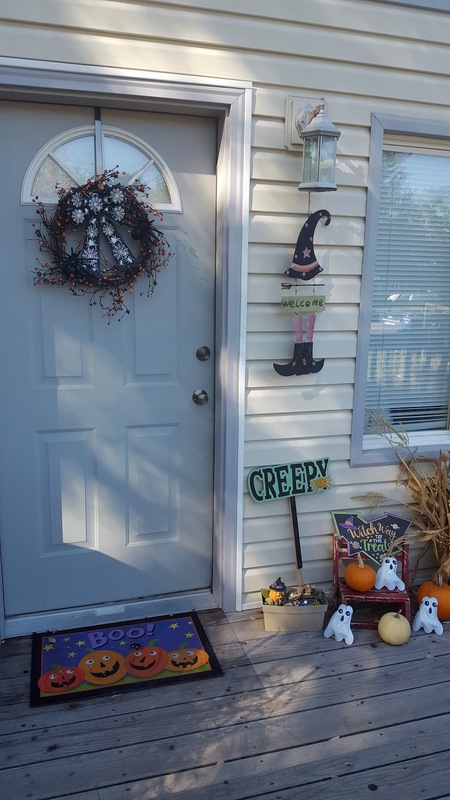 This is the first time in our home that I have been able to decorate for Halloween and I was beyond excited especially because I had a front porch of my own that I could go all crazy with it! 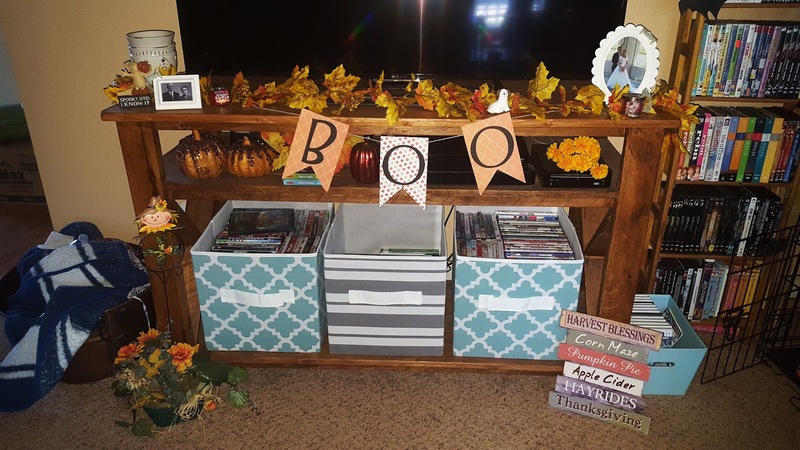 I absolutely LOVE decorating for the holidays but Fall/Halloween time is one of my favorites because it just makes everything seem so cozy and fun. If you remember from last year.. I DO NOT like Halloween due to the scary things that come with it. I DON'T do scary and thankfully the Mr. doesn't either. (Got lucky there!) So everything that I decorate with is considered the "cute" part of Halloween ha ha. 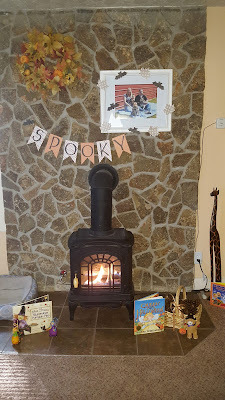 Well enough chit chat, I sure hope you all enjoy this mini house tour of how I decorated for Halloween! I got the cute pumpkin garlands at the Dollar Store last year and also last year my mom gave me the "welcome" pumpkin that she used to have hanging outside at her house. I'm so lucky! I thought that this was a warm and inviting way to welcome people to our home and to enjoy the decorations. The corn stalks are from The Grandparents garden they were kind enough to let me have them for decorations! 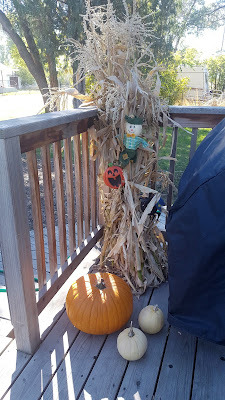 The scarecrow I got from the Dollar Store and unfortunately he got ate by some goats so he is a little banged up but I still used him anyways! Hey it adds character right? The metal spider is from Family Dollar and I got it three years ago after Halloween for a whopping .25 cents! The metal pumpkin is again something that my mother passed down to me! Thanks mommy. Ha ha! The large orange pumpkin came again from The Grandparents garden and they were so kind to share! The white ones came from this persons house here in the town that sells pumpkins for way cheap! We always go there to pick our pumpkins to decorate with and to carve later on for Halloween! The wreath is one that I made! My mom got the berry wreath I believe at Shopko three years ago one for me and one for her! I got the bow at the Dollar store along with the big sparkly spiders. The Boo! rug I got two years ago at Lowe's after Halloween for $2.00! 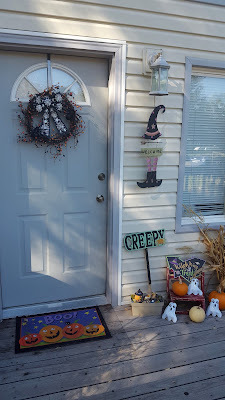 The "welcome" with the witches hat and feet was again something my mommy gave me. 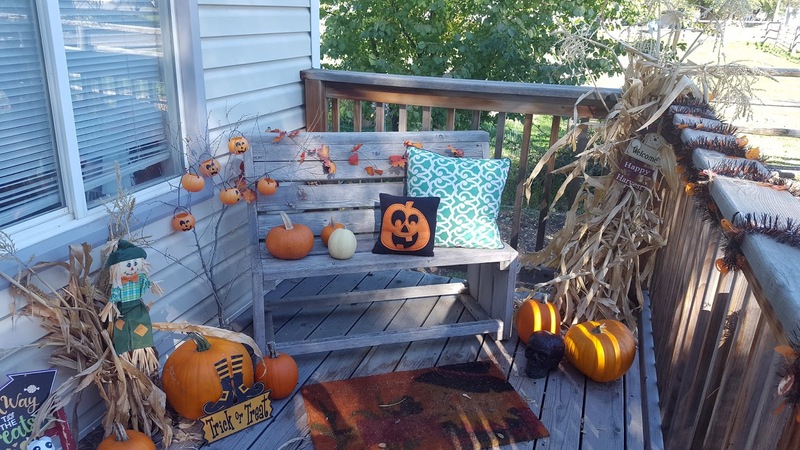 The red stool is a prop I use for photography and also for my fall decorating because it is too cute! The creepy sign my mom gave me but it came from the Dollar Store as well as the three blow up Ghosts which I got this year! In my Fairy Garden the Halloween house came from the Dollar Store and the fairy and scarecrow came from a store that went out of business. James' grandmother bought them for me because she wanted to help decorate my fairy garden. The truck that is holding the pumpkins came from Joann's for $1.99!! It was too cute I just had to get it. Again the pumpkins you can see are from the persons house here in town. Hey look.. another scarecrow from the Dollar Store! I bought him to replace the other but ended up using both! Ha ha! The "Witch way to the candy" and the "Trick or Treat" signs also came from the dollar store. The pumpkin tree was my craft this year! 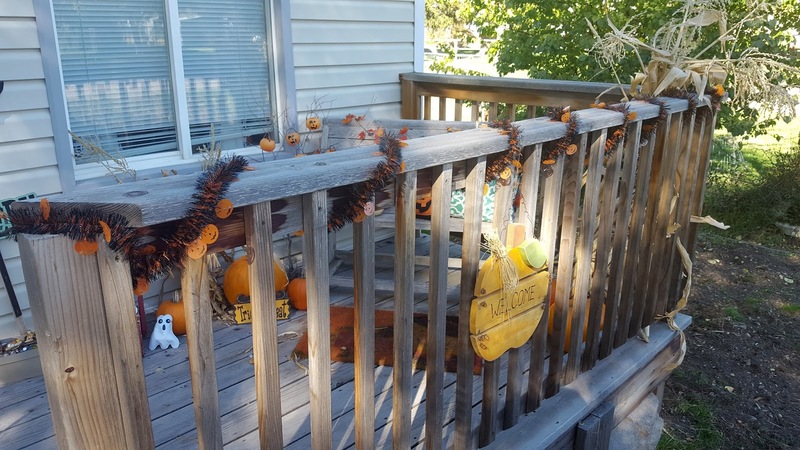 I got the pumpkins that are hanging at Target in the dollar spot and then used one of the branches from my huge tree we cut down to make my "Halloween" tree. The pumpkin in the back on the bench the tiny one is the ONLY pumpkin I was able to grow this year... AND it was on accident too ha ha! So that is a HUGE accomplishment right? The scarecrow rug came from Target three years ago! I just LOVE Target! The sparkly skull I got this year for .10 cents at a yard sale! 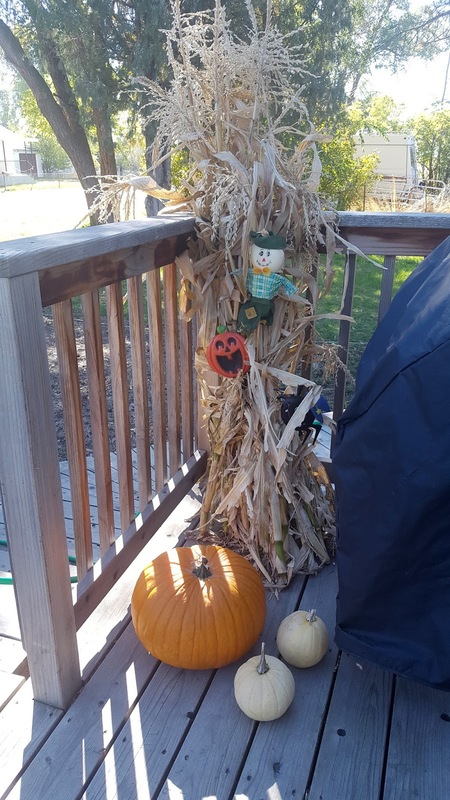 The large pumpkin next to the big corn stalks is also one from The Grandparents garden. Oh yeah! See those small cornstalks? Well... those came from my garden ha! Yeah needless to say we didn't have ANY corn this year. The cute pumpkin pillow on the bench is also from Target in the dollar spot and the green pillow was supposed to have an orange and white cover but that's a whole other story.. so it stayed green and it is from JcPennys. Welcome to the inside of the house! Yes, it is cold enough here in Idaho to have the fireplace on.. The wreath I got at a yardsale three years ago for only $1.00! It sure was a steal of a deal. If you know me you know I LOVE, LOVE yardsales! The "spooky" banner, leaves and bats I made! Woo-hoo for being crafty eh? The basket with pine cones I got at my bridal shower and the pine cones I got at the food bank. The Queen of Halloween book by Mary E. I got from Seagull Book a long time ago! I absolutely LOVE her and if I can get my hands on any of her work I will for sure. The little bear I got also a long time ago and I can't remember from where. Miss Fiona's Stupendous Pumpkin Pies book I also got from Seagull Book two years ago it is way, way cute! The two little witches I got years ago from the Dollar Store they are some of my most favorite decorations! The Charlie Brown book I got last year from Shopko after Halloween. The "fall" banner is one I also made. The pumpkin printable I got from Pinterest and the leaves I got from James' grandma. Once again the "boo" banner I made! I got the leaf garland from Micheal's last year. The orange flowers are from the Dollar Store and I got them awhile ago. The "spooky and I know it" and the boo dog little figurines I got from Gordmans two years ago after Halloween. The candles were FREE from Bath and Body Works and they are pumpkin apple scented and they smell AMAZING! 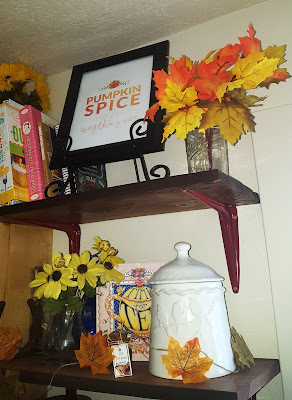 The sparkly pumpkins and the orange one my grandmother gave me last year because she knows how much I love to decorate. The scarecrow metal stick thing is from the Dollar Store and I got it three years ago. The plant that it is sticking in is from my mom again just something she no longer wanted. The sign on the right I got this year from the Dollar Store! Gotta love cheap decorations right? Welcome to the kitchen! 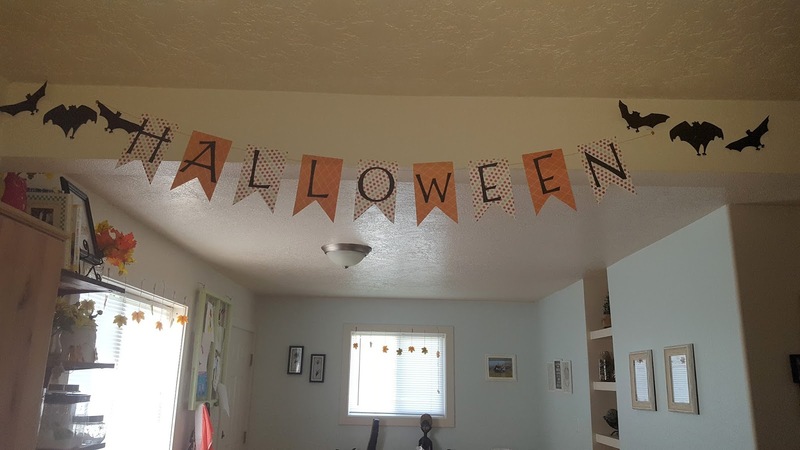 Again, I made the "Halloween" banner but I did not make these bats. I got them three years ago at the Dollar store. The leaves you can see hanging in the window I also got at the Dollar store then just attached them to some twine that I also got at the Dollar Store. 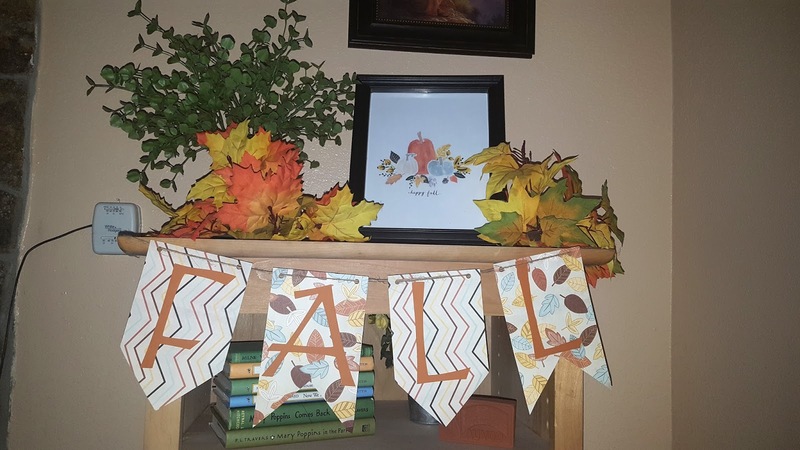 The leaves are again from James' grandmother and the "pumpkin spice" printable was from Pinterest. The other leaves on twine were just leftovers I had so I sat them there. Well that is all for this Halloween house tour! I sure hope you had a fun time and enjoyed! I would love to see your decorations so please leave a comment below or send me a picture!! Thanks for stopping by! I GOT TO SEE MY GRANDMA!!! 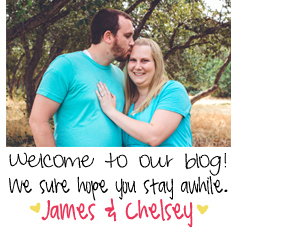 Five Random Things About The Mr. & The Mrs.